Are you feeling the Valentine’s LOVE yet? I really like Valentine’s Day. I love making cute little things with my kids and I think it is such a fun holiday! But is it just me, or are guys hard to make things for? You don’t want to give them something too “cutesy”! This Valentine gift is cheap, easy, heartfelt…and can be filled with food! Perfect for the man in your life (or anyone else you want to cheer up) this Valentine’s Day! 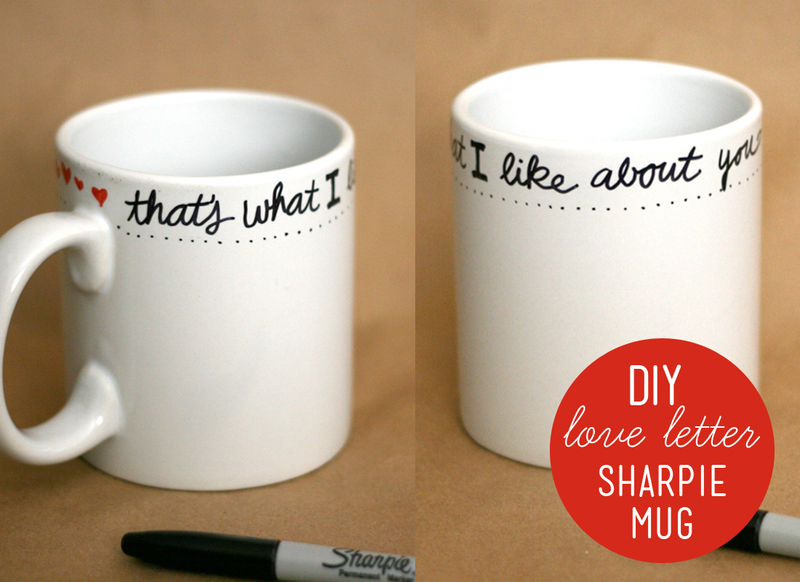 It’s a twist on the fun Sharpie Mug trend. 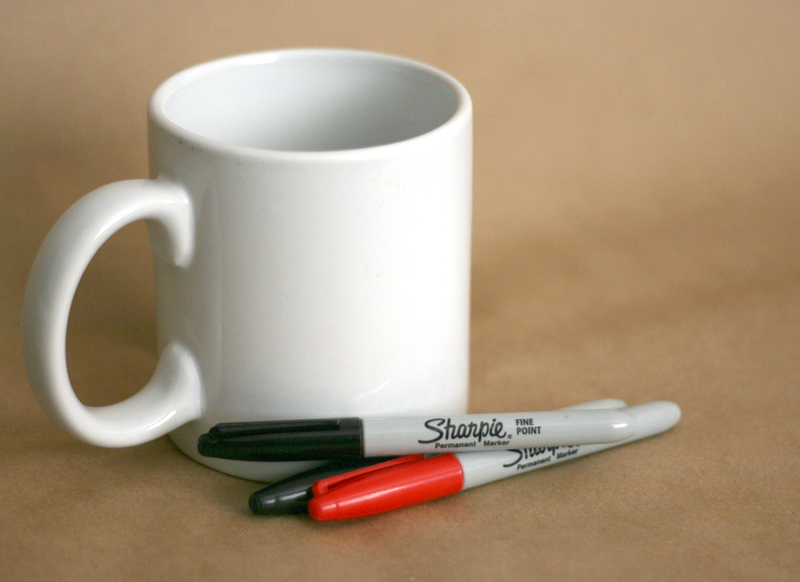 If you have no idea what I’m talking about, here’s the deal: You can write on a ceramic mug (or plate, etc) with a Sharpie marker, bake it, and it’s washable. Cool, right? 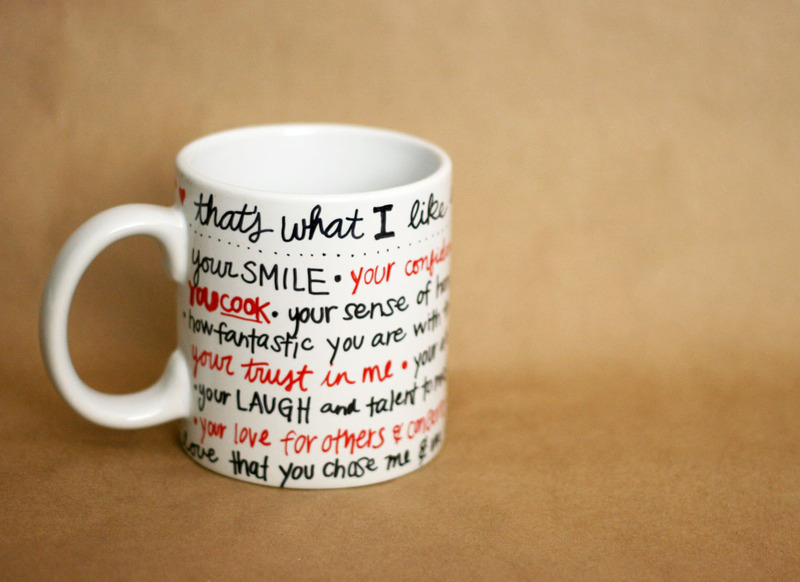 I decided to turn this cute oversized mug (from Dollar Tree) into a little love letter. I wrote across the top,”That’s What I Like About You!” and filled in the rest with reasons I love my guy. Easy! Disclaimer: I do not love my handwriting. Fact: Most men don’t analyze handwriting like we do! Haha! Stick the mug on a cookie sheet and bake at 350 for 30 minutes. Let it cool completely and you’re all set! Some have had luck with washing in the dishwasher, but I’m going to stick with hand-washing this one. Finally, I filled it up with some of his favorite red treats. One more gift checked off the list! What are you making or buying your Valentine this year? « New Year’s Resolutions: It’s Never Too Late! Your handwriting is fine! Makes it look like a homemade gift (and it is)! Love this idea!!! your handwriting is great, you should see mine, look’s like a 3 year old LOL. pinned this! This turned out so cute! I was actually thinking of taking a sharpie to a few dishes the other day, now I know how to do it correctly! What a fabulous gift! 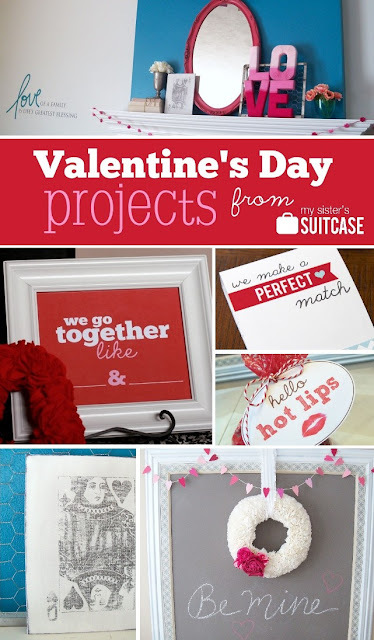 I’ve kind of picked ideas for most days leading up to Valentine’s Day, but I love this idea! Adorable!!!! What a wonderful gift!! I was reading and looking at your pictures and thought, wow her handwriting is so pretty. Then I read what you wrote. Ha. What a really nice gift. Adorable! And you have great handwriting. This is a fantastic idea for the Sharpie craze and a love note on a mug is perfect! Love it! Thanks for the idea. Can’t wait to read more! Did yours stay on after baking? We’ve tried this several different ways and the Sharpie rubbed off on ALL of them. Before they were even washed. All of the reviews we’ve read say you have to use these http://www.settocelebrate.com/porcelain-paint-markers-food-safe.html?cmp=googleproducts&kw=porcelain-paint-markers-food-safe and that the actual Sharpie permanent markers do not work. I was wondering if you had a secret to keeping the sharpie on it since those other pens are quite expensive. I was wondering the same thing as this happened to ours also. I’ve heard some say they didn’t have luck with the Sharpie staying on…looks like there’s no rhyme or reason as to why it works or doesn’t work. The paint pen-type markers would work for sure, if you don’t mind the cost. I’m sorry some of you aren’t having success! The only thing I can think that might have helped is I waited a few days before I baked mine. I’ll keep looking for more tips! Also see link above that I posted from A Beautiful Mess! Thanks! 350 farenheit right? I seldom bake so yeah.. Such a great, personalized gift! Love it! This turned out so well. I bet your giftee loved it! 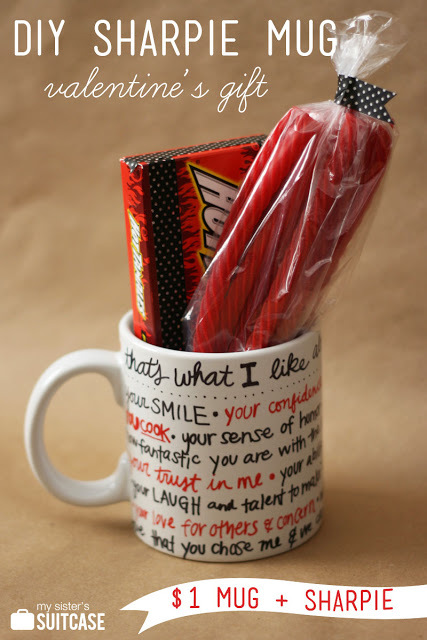 It was really a great personalized gift, i have come across this post much later but want to say thanks for sharing this interesting DIY Sharpie mug gift idea. Has he tried using it and washing it yet? I wanted to know if you were successful with regular sharpies as most people have reported major fails!! She means a metal baking sheet. 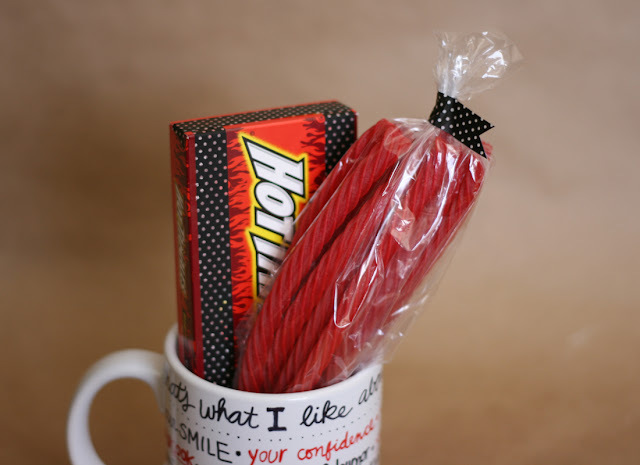 Although, I think you could put the mug directly on the wire rack in the oven and it would work. Just be careful taking it out so it doesn’t drop and break! I baked mine and after hand washing once it started to come off… any ideas?